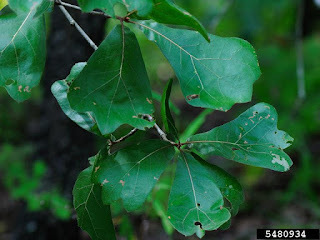 The Blackjack Oak, Quercus marilandica - is a small to mid sized, scruffy tree that is found growing in dry areas and generally doe not reach heights of more then 15-50 feet tall. The tree develops an irregular shaped open crown full of crooked branches. 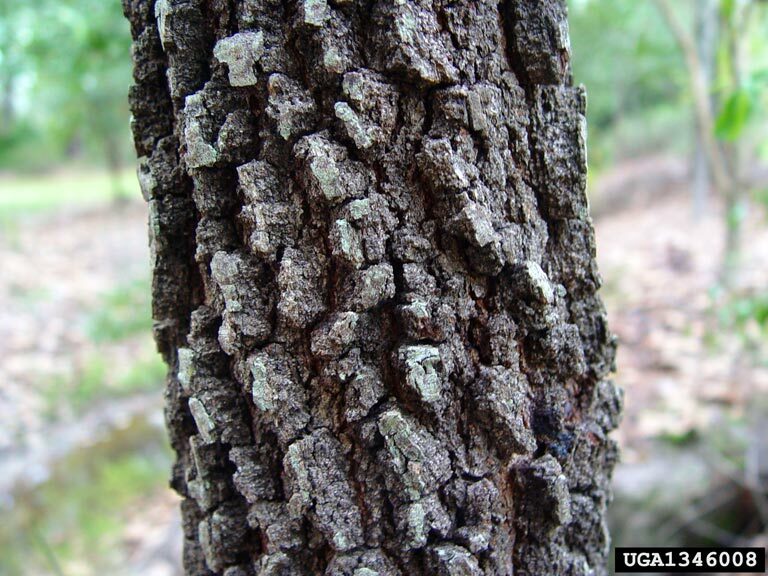 Blackjack Oak is one of only a few Red Oaks that manufacture and store the substance called tyloses. Tylose seals it's vessels and makes the wood watertight. The Blackjack Oak remains small in size and is often considered to have knotty wood which prevents it from having any value as a commercially produced lumber. The leaves of the Blackjack Oak are tough and leathery, triangular in shape, 4-8 inches long and wide with three shallow and broad tipped lobes near the end of each rounded base. The bark is dark gray to almost black in color with some silver flaking on the surface, very rough on the surface with deep irregular fissures. There are one or two acorns on short stalks with reddish to brown colored caps in the shape of a top. The nut is elliptical 1/2 - 3/4 inches in diamter with a stout point. Blackjack Oak is native to the United States and can be found growing from Iowa east through New Jersey and New York, South through Florida and west to Texas and north to Nebraska. It is almost always found growing on dry, sandy or clay soil.